As part of the Delaware River Watershed Initiative (DRWI) New Jersey Audubon (NJA) supplied, and provided labor to install, over 1,900 native trees and shrubs to five different riparian restoration projects in the NJ Highlands Region. Used in the restoration were 12 different native species that have exceptional habitat value, including, arrowwood viburnum, pin oak, silky dogwood, willows, American sycamore and buttonbush. These five restoration projects in total accounted for over 1 mile of stream bank stabilization and buffer areas to two major water courses in the region, the Paulin’s Kill River and the Musconetcong River. Ultimately the plantings will benefit water quality, soil health and floodplain function, as well as significantly enhance habitats for bird species, trout and other aquatic species, as well as threatened and endangered species, including the Wood Turtle and Brook Snaketail dragonfly. With funding from the William Penn Foundation and the National Fish and Wildlife Foundation (NFWF) for the DRWI, NJA aligns conservation efforts of multiple partners to accelerate protection and restoration efforts of the water quality in the Delaware Basin. The five restoration sites that received the NJA plant materials for buffers were properties that other conservation organizations, agencies, contractors and fishing clubs were the lead organization in implementing the projects as part of the DRWI. These entities included, the Wallkill Watershed Management Group, Musconetcong Watershed Association, North Jersey RC&D, Trout Unlimited, USDA-Natural Resources Conservation Service (NRCS), Trout Scapes River Restoration LLC, Warren County Rod & Gun Club and the Musconetcong Trout Club. One of the many benefits of a vegetated buffer is the filtration of sediment. By filtering sediment from runoff, the buffer is removing pollutants that bind to soil. The vegetation in the buffer removes these pollutants from runoff through plant uptake and by helping bacterial degradation of the contaminants. An example of this is, excess phosphorus from fertilizer binds to soil and is normally found in the top few inches of the soil, which can be susceptible to erosion. Trapping and filtering out these sediments from runoff in the buffer vegetation is a very effective way to reduce pollution entering the water body. The minimum width needed for an effective riparian buffer depends on the purpose you want the buffer to serve. However, the general rule for buffer width is, “wider is better”. “It was very important to significantly increase the riparian buffer at these farms to prevent chicken manure which is used to fertilize the adjacent crops, as well as any herbicides sprayed on the crops, from entering these important water bodies that supply drinking water and provide critical habitat to trout and other species,” said Brian Cowden, NJ Trout Unlimited Conservation Chair and Co-Owner Trout Scapes River Restoration. Although buffer plantings are essential to the protection of water, with the demand for land for other uses, the importance of buffers are sometimes forgotten and in some cases buffers are reduced significantly to accommodate other land use activities. Compounding the problem of buffer use on the landscape is that for the average landowner or farmer finding the money, time and most especially the labor, to restore buffer areas correctly. To address the labor and time issue with correctly installing buffer plantings, NJA secured additional funding in 2016 to contract the NJ Youth Corps of Phillipsburgto be an “on-call” work force to perform river bank and wetland restoration and other stewardship activities associated with the DRWI. The NJ Youth Corps is a year-round program that helps young adults (ages 16-25) earn a high school diploma while developing employment skills through community service projects. For projects associated with NJ Audubon, the Corps participants have been trained through the Waders in the Water program, which students receive classroom instruction on developing work skills in ecological restoration projects and environmental science. Specifically, through NJA’s outreach and conservation planning in the region, NJA provides the Corps with Service Learning projects in support of the DRWI which increases the pace of project implementation in the field, and the projects also provide Corps members with valuable employment skills associated with their training. Although water is an essential resource and we obviously need it to survive, unfortunately its availability and quality are often taken for granted. By engaging our youth in opportunities regarding water and science and having them become more informed can help create a future generation of stewards. 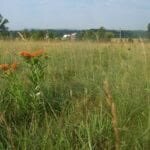 NJ Audubon is looking to engage more landowners for enrollment into the various federal conservation cost share programs for conducting conservation practices on their land, as well as distribute more free native plant materials. However to be eligible to receive free pant materials properties must be located in the following sub-watersheds of the Highlands region (the Lower Musconetcong, Lopatcong and the Upper Paulin’s kill sub-watersheds) and must exhibit a degree of ecological impairment. For more information please contact NJA Stewardship Project Director, John Parke at john.parke@njaudubon.org.